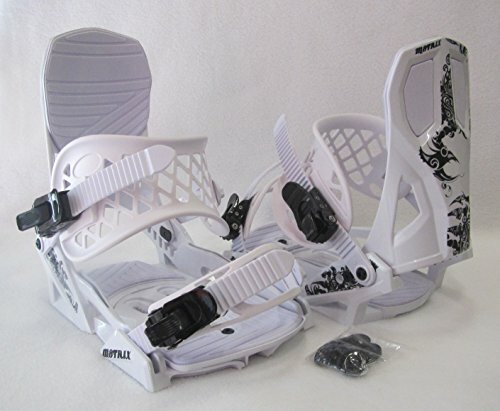 MEN'S M8TRIX SNOWBOARD BINDINGS (4X4 PATTERN) MEDIUM BOOT SIZE: 6-9 (WHITE/BLACK) by M8TRIX at Notakem Bara. MPN: PPW-M8TRIX-WHITE-MM. Hurry! Limited time offer. Offer valid only while supplies last. Newly designed Thermoplastic resin (TPR) ankle straps to provide more even pressure and hold the boots more securely in the heel pocket. The mesh design prevents snow from building up behind the strap. The TPR toe strap flexes over the toe like a rubber band to maintain more secure pressure. This binding comes with the mounting discs and hardware to mount to any standard four bolt pattern snowboard also has provisions for Burton 3D mounting pattern simply by drilling hole in each mounting plate. If you have any questions about this product by M8TRIX, contact us by completing and submitting the form below. If you are looking for a specif part number, please include it with your message.